Last week, SPH kick-started the latest quarterly reporting season with the release of its first quarter fiscal results for 2019, ended 30 November 2018. The remaining constituents of the benchmark STI are expected to report their latest quarterly or full-year results in the coming weeks. CapitaLand, CapitaLand Mall Trust are scheduled to release their financial results for FY 2018 on 23 Jan while CapitaLand Commercial Trust and Keppel Corp are expected to release their financial results on 24 Jan 2019. The STI has generated total returns of -6.5% and 5.2% in 2018 and in the 2019 YTD respectively. With a combined market capitalisation of over S$550 billion, the 30 constituents of the index have averaged Price-to-Earnings (P/E) and Price-to-Book (P/B) ratios of 16.6x and 1.9x respectively. Singapore Press Holdings (SPH) kick-started the latest quarterly reporting season with the release of its fiscal first quarter results ended 30 November 2018, while CapitaLand, CapitaLand Mall Trust, CapitaLand Commercial Trust, Keppel Corp and Singapore Exchange will release their financial results next week. The rest of the constituents of the benchmark Straits Times Index (STI) are expected to report their latest quarter or financial year results in the coming weeks. Investors can subscribe to the weekly Economic Calendar (click here) for confirmed schedules of other STI component stocks closer to the events. The table below details the confirmed, estimated and released dates of earnings reports by STI constituent stocks, sorted by date. The STI has generated a total return of 5.2% in the 2019 year-to-date and a total return of -6.5% in 2018. 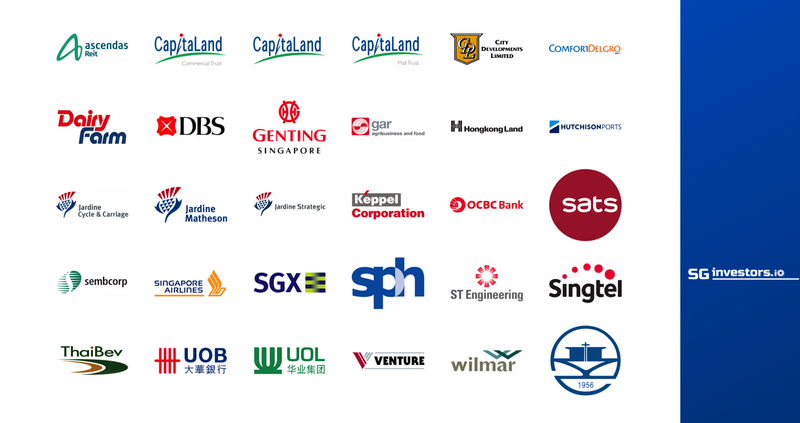 The 30 constituents of the Index have a combined market capitalisation of over S$550 billion and have averaged Price-to-Earnings (P/E) and Price-to-Book (P/B) ratios of 16.6x and 1.9x respectively. The STI also has an average dividend yield of 3.61%. A more detailed report on the STI’s performance can be found here. The table below details the comparative performances of the 30 constituents of STI, sorted by market capitalisation.